Above: Could this be an ancient waymarker stone that once guided travellers and traders across these windswept moors? Or did it perhaps mark a territorial boundary, or even the site of an ancient grave? 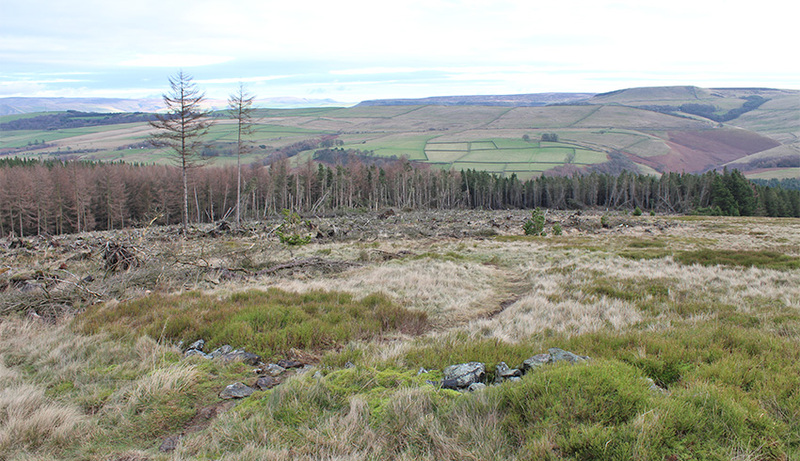 It was comments from both James and Chris that prompted me to search the slopes below Foxlow Edge for evidence of possible ancient settlements. The conversation had been sparked after I spotted a couple of faint circles on a Google Earth satellite image that I thought could be the remains of Bronze Age huts. I tried to discover more about the twin circles in the previous post. The archeological professionals think they were probably animal enclosures. Although they do say that doorways aligned east to west point more towards human habitation. Which the one with a stone border certainly seems to have. The word ‘low’ at the end of any place name in the district indicates an ancient burial site. It comes from the Saxon word ‘hlau’. The word before the word ‘low’ gives it identity… a family name. There are about 200 lows in the Peak District – mostly the white peak. …there is another, smaller, circular enclosure immediately north of the large ones which is also shown on the map and is shown as containing trees (this is due north of the large walled enclosure, and quite close to the Embridge causeway). Above: This fade shows the two features that may have historic relevance. Embridge Causeway is known to be a very ancient route – maps show it as a Roman road. The small lay-by is a short distance along the road, to the left. The map on the fade is from the 1890s (the circle is no longer shown on modern maps). Chris thinks this could be the site of a Bronze Age burial. It measures about 17m across. I have an open mind about what it might be, but I very much hope she’s right! I eventually found it after a fair bit of searching. It lies alongside an area of plantation that’s just been cleared. But there’s not much to see; just a jumbled circle of low-lying stones. Above: It would be wonderful if this was a burial site dating back to pre-history. But having seen it, I wonder whether it may be wishful thinking. There are loads of waymarker (ancient navigators) stones within just the valley itself. Theories I have about such stones as the Foxlow Edge one have now gained pace as evidence of our ancestors positioning these stones to navigate the trade routes from location to location. Standing stones can be simple navigation posts, define territorial boundaries, or mark grave sites; unfortunately all are as likely as each other (enigmatic is a good description for these features!). I think ‘enigmatic’ is the perfect word to describe all these features on Foxlow Edge; the larger twin circles, the smaller one, and the small standing stone. So until someone proves otherwise, I’ll believe that it’s perfectly possible they could be footprints left in time by our ancient ancestors. A page on Wikipedia says that the word ‘low’ in a place name is ‘often a hill with a barrow or hillocks on its summit’. Maybe Foxlow was simply a hill with lots of foxes, and the enclosures were to protect sheep and lambs. Just a thought!